Interesting AFD from DVN. 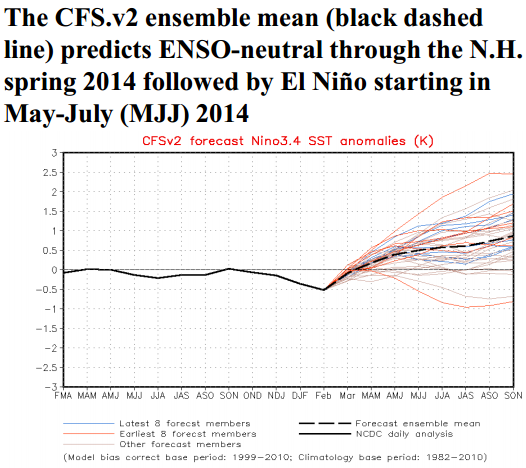 The very latest MJO forecast is quite more energetic than the one your posted in the blog. http://www.cpc.ncep.noaa.gov/products/precip/CWlink/MJO/ensplume_small.gif It predicts Phase 7 and 8 active. The NOAA composites for Feb-Apr http://www.cpc.ncep.noaa.gov/products/precip/CWlink/MJO/Composites/Precipitation/ indicate that active Phase 7 and 8 are associated with above-normal precip over the central US, but with abnormally dry conditions in California. Thus, the AFD seems a bit off in that regard (if MJO is the only predictor). The PNA is predicted to see-saw for the next few days, http://www.cpc.ncep.noaa.gov/products/precip/CWlink/pna/pna.shtml, going negative and then back to positive. I'm with you on the desire for verification. Also it would have been nice for the AFD author to be more specific - e.g., what "magnitude of energy changes"?? You're exactly right, Brad. However, this post was written on Feb. 5 when MJO was still considered to be 'inactive' by all metrics used, and the 10 to 15-day forecast from that time would have been verifying for this week.